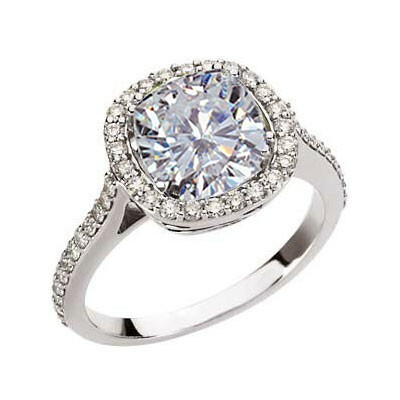 Moissanite is a naturally-occurring mineral that is an ideal substitute for diamonds. Moissanite looks and feels like a diamond and often has the same brilliance and is almost as hard as a diamond, but costs much less than the more expensive gemstone. This makes moissanite engagement rings an ideal option for anyone who cannot afford diamonds. 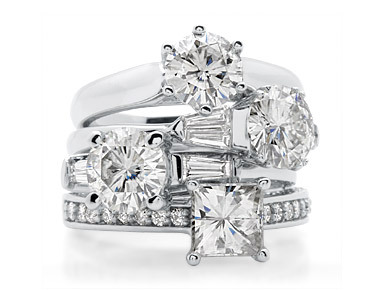 Below, are our ten favorite moissanite engagement rings. This amazing moissanite ring features a large, round center stone encircled by a halo of smaller, side stones. This ring can be set in either 14K white gold or palladium, and the center stone is available in various sizes ranging from one to four carats. 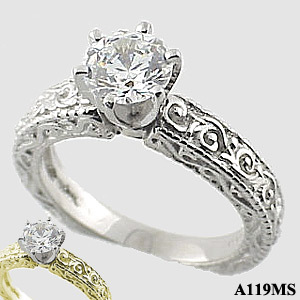 This ring has a delicate, antique design that will look fantastic for many years. 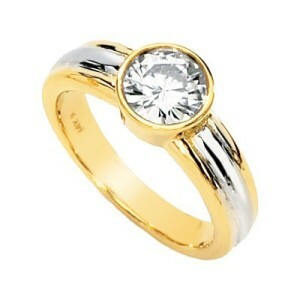 This ring features a beautiful round 1.5 carat center stone set in either 14K yellow gold, 14K white gold, or palladium. The band itself features 10 .025 carat, round moissanite side stones to give the ring a little more brilliance and pizzaz. This brilliant 14K yellow gold princess ring features three moissanite stones. A gorgeous trellis basket, inspired by tulips holds the center, princess stone while the two outer stones are held by three-prong settings. This ring is available in a variety of total carat weights ranging from 0.9 to three carats. This stunning engagement ring features a pave-set split shank set design set with 0.25 carat diamond side stones in 14K white gold. 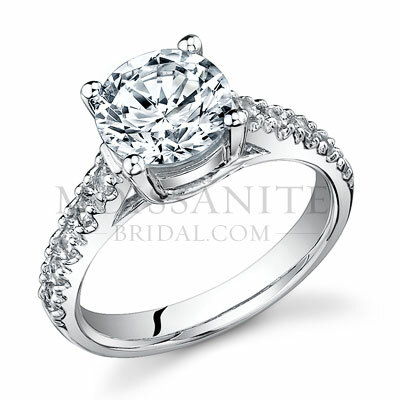 The center stone is a 1 carat moissanite which can be set in either a four or six prong setting. This ring has a modern look and is an ideal choice for any young, fashionable bride. This exquisite antique Victorian style engagement ring features a 1 carat, round moissanite stone set in a five prong setting. The 4mm wide band is detailed with beautiful scrollwork giving the ring a more unique look. This antique ring is available in both 14K white and yellow gold to suit any taste. This antique designer ring features a three carat moissanite center stone, surrounded by brilliant, round diamonds. The diamonds are also set into the 14K white gold band for a total of 48 diamonds with a total carat weight of approximately ½ carat. 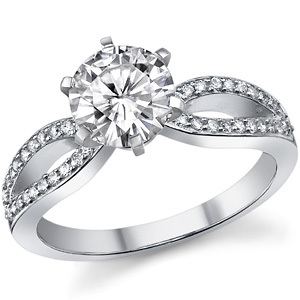 The center stone is nestled in a four prong mounting to ensure that it stays in place. This unusual moissanite ring features a two-tone design with a 14K white gold center band, encased in 14K yellow gold. The gemstone is a 6.5mm, 1 carat round moissanite stone in a yellow gold setting. This two-tone ring is very modern and is an ideal choice for the fashion-conscious bride. 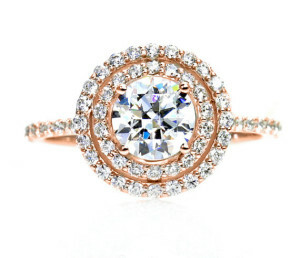 This feminine moissanite and diamond engagement ring is available in both 14K white, yellow, or rose gold. The center stone is a round moissanite that is 1 carat in size. 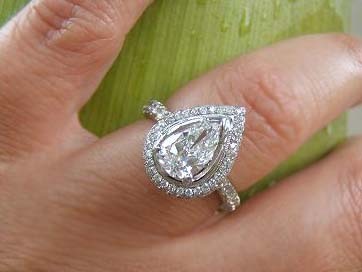 Surrounding the center stone is a double halo of small, sparkling diamonds, and more diamonds are set in the thin shank. The diamonds have a total carat weight of 5./8 carats. 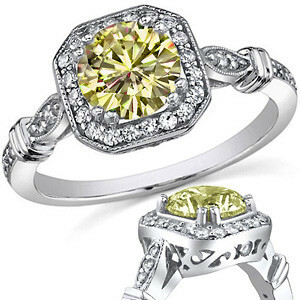 This beautiful halo style ring features a brilliant, round cut, canary yellow moissanite center stone. The center stone is surrounded by smaller white moissanite stones giving this ring a brilliant, colorful design. 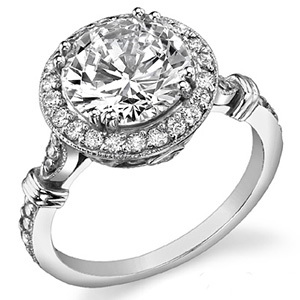 The ring is available in 14K , 18K white gold, or palladium, and the center stone is available in 1.25 or 1.5 carats. 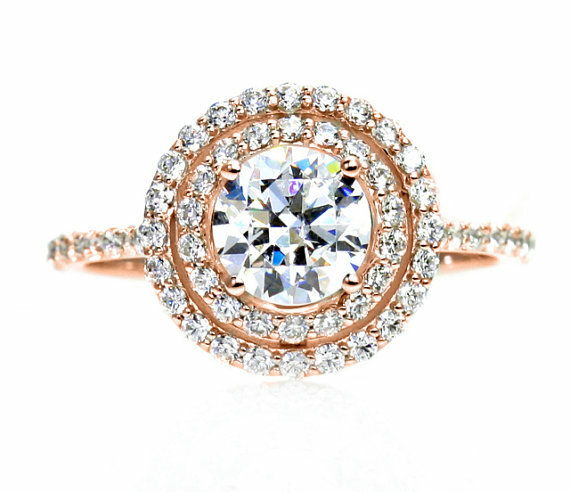 This amazing moissanite ring features a brilliant, round, pink center stone, with numerous round, moissanite side stones. The smaller, side stones continue down the shank of the ring for additional sparkle and detail. The center stone is available in various sizes from 0.75 to 2 carats and the shank and setting is available in 14K, 18K. or palladium. 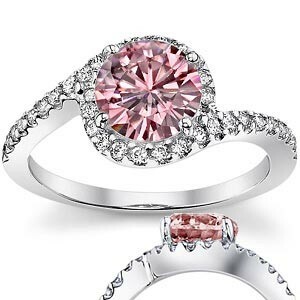 This ring is absolutely beautiful and allows any future bride to have a splash of color in her ring.